The early Vedic Indians built their cosmology by studying and observing their surrounding reality and validating it with the knowledge they found in the Vedas, which the seers (rsis) obtained for them through their unified vision of the universe in which they beheld the reality as the numerous aspects (organs) of one Universal Being (Purusha). They envisioned in God, the Supreme Self, a magnified version of the same personality that resided in their own bodies, by knowing which, they believed, one could achieve eternity and oneness with the entire existence. The same Nature, which sustained life outside and served as its foundation also sustained and upheld the life within. Thus the vehicle to bridge the vast spaces between this world and higher worlds was one's own self (body) through which one could reach gods and the highest Supreme Creator Himself. And as long as one maintained harmony with the world outside by observing the divine laws, one remained in the company of gods and secured a place for oneself in the immortal heaven. The distance between God and man was therefore so much as the distance between one's own mind and heart or between the waking consciousness characterized by duality and divisions of time and the deep sleep consciousness characterized by unity and timelessness. By and large, in their worldview God and man represented the same reality, but in varying proportions and in different dimensions. The external world was an extension of the internal world and through one's own body and mind one could reach out to God, the gods, the heaven, the sun and the moon. For them, existence and non-existence were the alternate modes of one eternal and absolute reality, that was unchangeable and yet provided room for such modifications as becoming and being through the illusion of activity and transformation. These ideas incited the intellectual curiosity of ancient scholars and led to the emergence of several speculative philosophies ranging from the most spiritual to the most materialistic and from the nihilistic to the most fatalistic. This, in essence, was the basic framework around which the inviolable Vedas accommodated a beautiful and appealing assortment of beliefs and practices that promised peace, prosperity, liberation and eternal life for anyone who dared to venture into the mysterious inner world of one's own beingness. Such ideas eventually found their way into the core and foundational philosophy of Hinduism, imparting to it philosophical depth and universal appeal for which it is presently well known. Its makes Hinduism down-to-earth and its basic tenets verifiable in the crucible of human experience. The early Vedic people divided the manifestation around them into a few primary components, namely the earth (idam), the mid-region (antariksham) filled with air or breath inhabited by invisible celestial beings and the heavenly region consisting of the sky, the heaven, the gods, the stars and the worlds to which people went after their death. This three tier universe was the sum total of everything (sarvam) which they identified as existence (sat) which emerged out of non-existence (asat) through the divisions and diversification of a vast primal egg. All this floated in the endless space of infinite Brahman in which events happened in recurring cycles and definite patterns until all things were withdrawn and the Great One retired into a sleeping mode. The Vedic scholars superimposed this basic structure of manifestation upon the worlds they saw and experienced through their ordinary senses. For them, the sun and the moon, the two objects that appeared strikingly in the sky, represented the two worlds in the sky to which souls went after death. The Sun represented Brahman, the highest God, the god of gods (devam devatra), the shining Self within, where pure beings went never to return. The Sun poured light upon the worlds, stood above all the naked eye could see, spread its rays endlessly in all directions and sustained life upon earth by providing warmth (tapas), breath (prana) and food or nourishment (annam) for life. If darkness invoked in them the worst fears of danger, uncertainty and death, the light of the sun and to some extent of the moon, provided them with hope and comfort and the assurance of an ongoing and recurring cycles of days and months, seasons and longivity. Therefore, they held the sun in great esteem as an object of the highest veneration and daily invocation. They worshipped it through sacrifices and meditated upon it through austerities. They also worshipped it five times each day with a set of hymns (Samans) and offerings: early in the morning, late in the morning, at noon, afternoon and evening. Such obligatory actions defined their lives and provided them with some degree of certainty and the assurance of divine help in an otherwise uncertain and hostile world. While the sun represented for them the immortal heaven, the moon represented the world of their ancestors to which mortal beings went and returned to earth after exhausting their karmas to take birth again and continue their journey. The selection of the moon as a symbol of the ancestral world was an obvious choice for it was not as bright as the sun; yet, in the darkness of the night, its presence in the company of stars, brought to them memories of the dream world into which they lapsed in their sleep. They also believed that one could enter a similar world either upon death, the final sleep in the life of a mortal being, or through trance, by inducing a near dreamlike experience drinking the Soma juice that was extracted ritually from mysterious herbs. For them the sun represented pure light of great brilliance, while the moon represented mixed light or light tainted with with some darkness (residue of past life impressions, unfulfilled desires and unfinished karmas). The sun was constant and unchangeable, in contrast to the moon, which waxed and waned from time to time. Thus in the sun they saw perfection, purity, eternity and immortality while in the moon imperfection, impurity, return, renewal and rebirth. Apart from these, they envisioned an underworld, below the earth, ruled by Lord Yama, where the sinners beyond redemption went to learn harsh lessons as part of their improvement and purification. What lived beneath the earth were worms and insects and as the Upanishads affirm those who committed heinous crimes were destined to be born as insects, worms and lowly creatures that lived underground. In others words, the mortal sinners went below the earth to the underworld and upon their return took birth as worms and insects that lived below the earth or crawled upon it. The Vedic people had no illusions about gods. For them the gods, who lived above the clouds and in the star-studded sky, were not meant for their liberation but for facilitating and enhancing their joys and comforts in return for the sacrificial offerings they received. The gods did not do them any free service. It was strictly on the basis of "give and take." By reaching them through sacrifices and Vedic chants, one could obtain their favors only after nourishing them. The gods were thus the means, but not the goal. They were their brothers, born to the same father, Prajapati, but not their masters. They were the last ones to be approached for liberation for they were fickle, like their senses, and not meant to facilitate their liberation but oppose it and prevent it by all possible means. As one of the Upanishads declares, the gods would not allow humans to achieve liberation because what the cattle were for humans, the humans were for gods. The cattle nourished the humans, while the humans nourished the gods. Just as no one appreciated the idea of losing cattle, no god appreciated the idea of losing humans by way of liberation. Therefore, they were certain that gods would not be happy if one tried to be smart with them and made efforts to go beyond them. The primary aim of a spiritual person, who was aiming for liberation, should therefore be to establish self-control over the divinities (bodily-organs) in his body and through that over the gods in the heaven. Otherwise, they would do everything in their capacity to discourage him and pull him down in their effort for liberation. The Vedic people also concluded that existence was shaped primarily by two factors, those that contributed to order and regularity of things and those that contributed to disorder and chaos. The gods represented the former and the demons the latter. One lived happily when life was structured and orderly and one suffered greatly when unpredictable calamities happened and people’s lives were thrown into disarray and chaos. Peace and prosperity contributed to the orderliness of life while death and disease brought misery and chaos. The gods represented the pleasure principle while the demons the pain principle. When a person indulged in selfless actions through his bodily organs, he secured happiness, peace and prosperity. When he used them for fulfilling his selfish desires and evil intentions, he suffered from pain and disease. In the body, they believed that breath (prana) symbolized regularity and orderliness. Since it circulated in the whole body and energized the organs by nourishing them, they considered it supremely divine. While they found that the senses were vulnerable to evil (pain and suffering) and temptation, nothing could upset the movement and the regularity of breath in the body of a living being. While the demons succeeded in leading the senses astray, they were shattered into pieces when they attempted the same with the breath. It was breath which made possible speech in the body and it was breath which made possible life upon earth. It was when the breath was withdrawn from the body, that life came to an end and night descended upon it. The Vedic people believed that human beings had little control over the world and the forces that regulated it; but with discipline, austerity, the practice of yoga (penance) and the cooperation and protection of gods, they could bring order and regularity into their lives and establish peace and prosperity upon earth. This made them to recourse to sacrifices, because they believed that sacrifices gave them the ability and the opportunity to establish communication with the gods, secure their help and manifest their desires with greater certainty. What sustained and facilitated the sacrifices were the sacred sounds hidden in the hymns of the Vedas. For the Vedic people, sound gave them the ability to summon the gods to the ritual place and manifest their desires. By unleashing the sounds hidden in the Vedas through the chanting of the Samans (hymns), they believed that one could manifest things and fulfill one's desires. The sounds hidden in the Vedic hymns enabled adept priests well versed in the scriptures to unleash the power of Brahman and sent their supplications as far as the heaven and the ancestral world. Thus, they believed in the unassailable power of sacred sounds. For them sound signified the power of Brahman, the very power that Brahman unleashed during the performance of a Primal Sacrifice to manifest the entire creation and leave behind a ritual models for humans to follow. Thus, sound in its most primal and generic aspect carried great significance in the ritual practices (karmakanda) and to a lesser extent in the spiritual practices (jnanakanda) of the Vedic religion. Sound (sabda) was the means by which human beings could reach out to the other worlds, to gods and ancestors. Sound was the medium by which humans could maintain and uphold the divine laws and secure a place for themselves in the immortal heaven. In the microcosm of the human personality it manifested as speech (vac) with the breath (prana) in the mouth as its source. 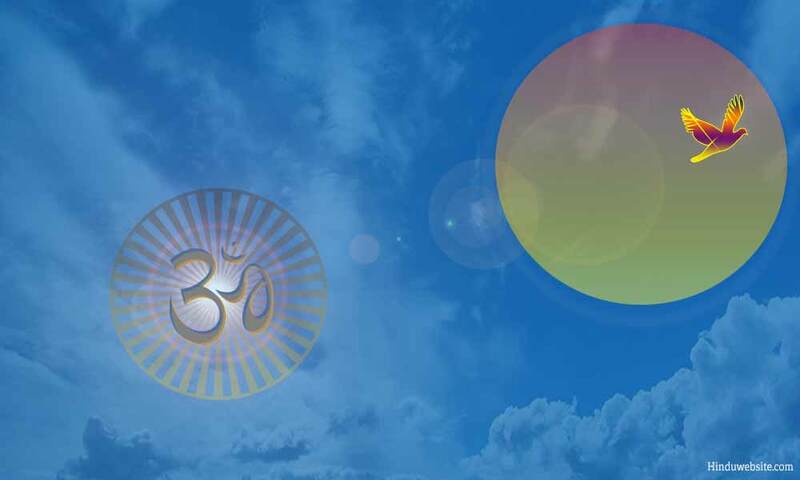 In the macrocosm of the universe it manifested as sounds of various kinds, whose source was none other than Brahman Himself, represented in the form of Aum. It was sustained by space (akas), the physical personification of Brahman and carried by breath (air). The Vedic people saw the world clearly in terms of good and evil with no common ground in between. They believed that the conflict between the two was eternal, inevitable and uncompromising. The triumph of gods over the demons was always short lived, as the demons were relentless in their attempt to overpower them. In this battle of galactic proportions, human beings had no choice but to align with gods and remain secure in their protection. The gods and humans were meant to live in close harmony because they depended upon each other for their joys and comforts and for sharing the duty (dharma) of upholding the divine order. The gods received the sacrificial offerings and in return helped the humans to manifest their desires. The gods and the humans were meant to live for each other, not for themselves. Living for oneself meant evil a practice which the demons followed like religion. The demons lived for themselves. They were utterly selfish, egoistic and self-centered. In the game of creation, they were the spoilers and meant to be so by the will of God. They were meant to disturb beings, create disorder, interrupt and disrupt life upon earth, cause misery, sickness and suffering through their reckless actions and spread darkness everywhere by piercing things such as our minds, bodies and senses with evil and demonic desires. The gods, on the other hand, personified virtue, light and divinity. They would not take what did not belong to them and what was not offered to them because they served God, respected His law of obligatory duties (dharma) and upheld the order and regularity of the worlds (rta) as established by Him. The demons did the exact opposite. They would seize whatever they liked or wanted even if they were not meant to do it and they had not legitimate right to it. The gods upheld the order and regularity of the worlds (rta) while the demons broke it at every possible opportunity. If the gods were compared to the light or rays of the sun, the demons were more like the clouds that descend upon the sky from time to time and threatened the very existence of people, until Indra intervened with his lightning weapon and released the water and the rays of the sun held by them in captivity. These are but a few significant aspects of Vedic imagery gleaned from the Upanishads to denote their relevance to present day Hinduism and their role in shaping its core beliefs and practices.